This is one of my favorite birthday traditions. I love the sheer possibility of it… The pure hope when you’re young and are wishing for a new Barbie or book. When you’re older, it means that maybe, just maybe, you’re throwing your deepest hopes and dreams out into the universe with the wish that some cosmic force will deem you worthy of granting your heart’s desire. For this offering, I finally put to use a technique that has been popular for ages, but I’ve never been interested for the single reason that I might get messy: embossing paste and stencils. I used this Memory Box stencil and some Dreamweavers Pearlescent embossing paste to create the background after blending Dusty Concord and Chipped Sapphire Distress Inks on a watercolor card stock panel. I have to say, this technique is awesome. I can’t wait to get my hands on some more stencils and put this embossing paste to good use. After I spread the paste out and let it dry, I die cut the star from the panel using Wplus9’s Clear Cut Stackers: Star (the middle size). It’s not quite the right star shape for what I initially had in mind for this card, but I went with what I had. 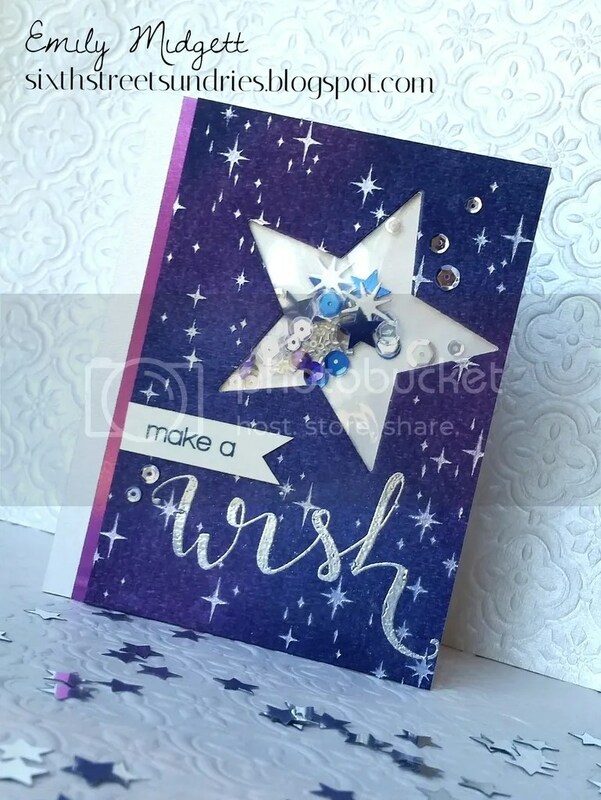 The sentiment from this absolutely wonderful and versatile Make a Wish set from Create A Smile was kinda tricky; I had initially intended to do something with vellum, but it just didn’t look right. 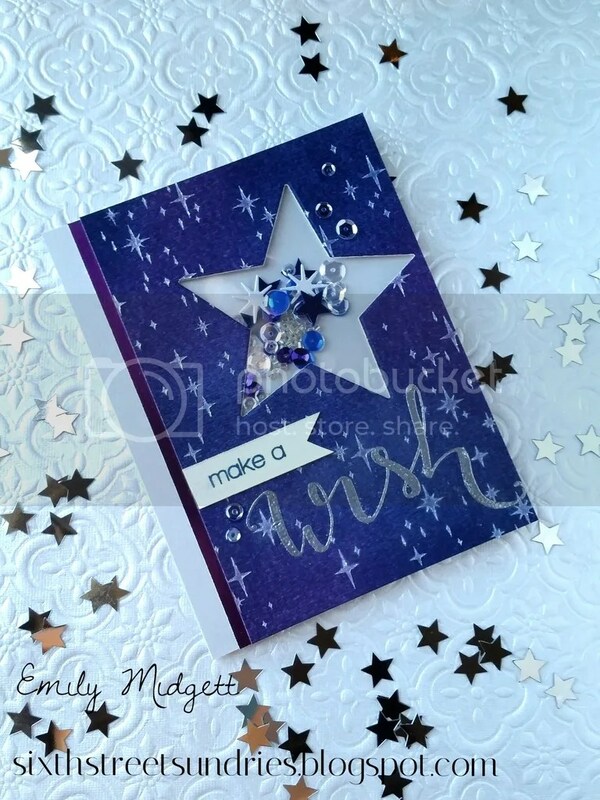 I ended up heat embossing the sentiment on the panel over the top of the paste stars in silver embossing powder. I created a little shaker pocket using my WRMK Fuse tool and some sequins I had in my stash. After doing all of that to the main focal point, I had to continue the magic with shimmer and shine on the rest of the card. I used a strip of purple DCWV foil card stock and some dove gray Neenah shimmer paper as accents on the side of the star panel. I mounted it on a gray card base and called it quits.